With just a couple of weeks to go 'till the doors open, we figured an update is in order. As you can see, the weather has cooled off and we've actually had a day or two of light rain to soften the blow of this summers scorching heat. The air has cleared now that the fires are all but out, and we're enjoying crystal blue skies. The trees are starting to turn and the fall colors should be peaking the weekend of the show. Things are pretty much status quo with regards to the show. Table sales are close to last year at this time and, as always, there's a few procrastinators that will wait until the last few days to reserve a spot. We are donating one table to the Federation (FOHBC) to help promote membership. Ferd Meyer, president of the Federation, has indicated that it will be manned for part of the day on Saturday. I'm attaching a full page copy of the show flyer. Just click on it, and it will open in a new window where you can print it out. If you have time, and are so inclined, burn a few copies and hand them out to junk shops, antique malls, second hand stores and what have you. Every piece of advertising helps! We'll be going online today with a last minute push via Craigslist as well. One area which is an ongoing challenge, involves the displays. I'm asking everyone to consider setting up a display. It doesn't need to be elaborate, and I'm doing away with display judging this year to take away the stigma of competition and "winners and losers". Plus, each displayer will receive a $20~ bill as a thank you for their efforts. Feel free to talk up displaying with your fellow collectors as well. 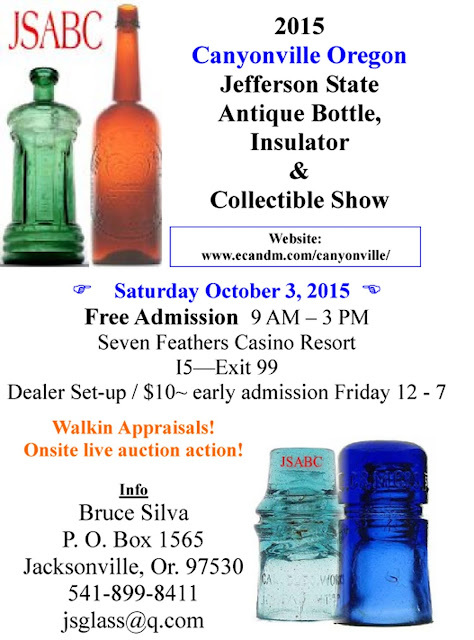 We're going to set up one open display space for Oregon bottles / insulators, and would ask that each collector / dealer bring an item that is either embossed Oregon, or was dug in Oregon, to be set up on a display table. It will be a secure location and each bottle will have an ID sticker affixed to the base identifying the owner. We've got room for up to five additional displays and it sure would be nice to fill the spaces.